Reid Hoffman, the co-founder and chairman of LinkedIn, once said that running a startup is like jumping off a cliff and building a plane on the way down. The good thing is that no one has to do it with their bare hands! There are plenty of tools out there that can make this backbreaking project easier. 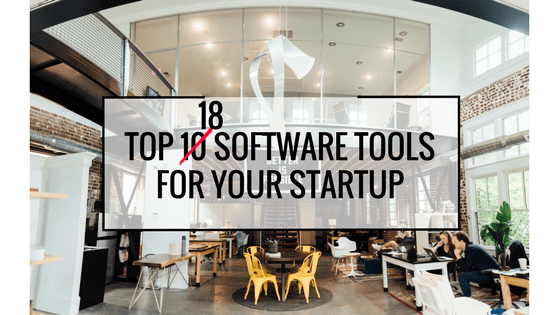 Here are some of my favorite ones – I’ve listed them earlier in my answer to a Quora question about my top 10 software tools for startup. Note: very subjective! After almost 1 year since the first publication of the list, I’ve decided to update it, presenting some of the alternatives for the chosen apps along with the new ones. I guess I don’t need to introduce these tools to anyone. Using one of them is probably the easiest way to communicate with your team. You can create many rooms for the people working on different projects, which makes it clear and easy to follow. Integrations with other tools that you use (so that you can get the notifications) make them even more awesome. Right now, SaaS Manager helps enterprises struggling with the commoditization of their services. On one hand, they can enhance their offer with services from other vendors. On the other hand, their own products can be published to be resold by others, bringing them new customers and new markets. However, it’s not what SaaS Manager has always been. At the very beginning, it was planned to be… a platform that helps startups build cloud applications 3+ months faster. It helped us build most of our products – in the case of SkillHunt (the recruitment platform for IT based on referral programs – worth to check if you need to hire developers, by the way) it took us only 11 weeks to build the MVP. A tool for streamline appointment scheduling. Integration with all my calendars makes scheduling appointments suuuuper easy. You can set various types of meetings and put in your welcome message. The app integrates with all the major calendars and – the best thing – it sends reminders about the upcoming appointments for you and your prospects. No more back-and-forth e-mails! PS. You can check how it works by scheduling a call with Mateusz to see how Neoteric can help your startup! Nice tools to keep your work progress clear. You can arrange larger projects into “boards”, assign other people to your project, share tasks, files, and comments. They let you visualize your to-do list in a way that’s easy to follow, which really helps you manage your time. For more complex projects, I would rather recommend using Taiga. Have you ever got embarrassed by seeing a spelling mistake in the e-mail you’ve sent to your client or partner? Then you will love these tools! They check your writing for grammatical, spelling, and punctuation mistakes. You can use them as apps, download them to your computer, or install them as plugins to your browser. Irreplaceable if you create ANY content. While Grammarly will be helpful only when you’re using English, LanguageTool works for 28 different languages. But its accuracy depends on the community – it’s an open-source app and some languages are more developed than others (compare 2947 rules for the Catalan to 7 rules for the Belarusian). It’s like a spellchecker, but for the style. Do you put a whole lot of effort into making your texts sound very smart and beautiful? Don’t. Really. Your visitors don’t come to your website to enjoy sophisticated prose but to get information. It’s a great app to check if your posts, emails, or articles aren’t too long or complex. We’ve started using it very recently and so far it’s the best tool for social media monitoring I know. It searches the Internet for the set keywords, allowing you to track mentions, brand, name, competitors, news from the niche and whatever you need. It helps you track your online presence and reputation (don’t hope that all the opinions about your product will have @ or # to be easily tracked!) but also reach ambassadors, influencers, and potential customers. A few days ago they introduced a new feature: Brand24 Interactions for Twitter, Facebook, and Instagram mentions, showing how popular a given post is. Which makes it even cooler! I don’t know any better (free) tool for analytics. As it’s very complex, you need some time to get to know it. But once you do, you can learn a lot about your audience and their interaction with your website. A simple tool to make really nice graphics for blogs and social media. I like the set templates for various channels (eg. Twitter, Facebook) and free layouts (hack#1: if they are paid, it’s usually because of the photo so the only thing you need to do is to replace the background image with some free stock photo). You will not make a great art with it but for simple designs, it’s all you need. That’s the most obvious one but it would be a shame not to mention it at all. I put all my reports and important notes there – it’s easy to share, it allows many people to work simultaneously on one file. And the best thing: I can access my files from any device. An absolutely irreplaceable tool when you have to manage multiple Twitter accounts (btw, don’t forget to follow Neoteric!). You’re able to view all at once: the lists you follow, your notifications, and your direct messages. It is also possible to tweet from there, send messages and even schedule a tweet. A free command center for Twitter. A smart and easy way to schedule content across social media. The free plan lets you connect profiles from each network (one from Facebook, one from Twitter, etc.) and to schedule 10 posts ahead for each network. A nice tool for the personalized cold-emails automation. It sends emails and follow-ups one by one as if they were sent manually, letting you send cold emails that are surprisingly… warm. It saves a lot of work for the SDRs. Also, there are statistics of opens and clicks, so you can check your efficiency and improve it if necessary. A live-updated database with millions of companies supplemented with easy-to-use segmentation tools and handy filters. It automates sales by connecting you with the right business people at scale. A multi-tool which consists of three apps: Designer, which is very similar to Canva, Collage Maker, and Photo Editor. All of them work in the browser, they are very intuitive, they have a lot of free templates, and they help you create stunning graphics for your blog, social media, or other purposes. An awesome marketing automation multitool! With this single application, you can add the chat to your website or application, create, send and track email campaigns, automate customer journeys, adjust your communication to the actions taken by the user, run A/B tests, collect data to personalize the communication, streamline the sales process with integrated CRM, and do other cool stuff to improve conversion. Data-Driven PR Software: a great set of tools to create press releases, brand newsrooms and to send out the PR pitches. It helps you manage media relations, create content and pitch your stories to the relevant audiences. Basically: it helps you make your content more visible. As they introduce themselves: an all-in-one solution for driving predictable revenue growth. I’ve never used it but I’m so impressed with the idea that I couldn’t stop myself from putting it on the list! Growbots is a tool for sales automation which matches the companies who sell products or services with the companies who need these products. You don’t need to get involved until the last phase of the selling process, when you get well-qualified leads, talk to them and (hopefully) close the deal. What are your top software tools? Share your list in the comments! Slack vs Rocket.chat vs Hangouts Chat – which team communication tool is the best?